Think back to when you were in school. How do you remember learning new vocabulary words? Which do you remember? As we all know, the way that students learn has changed over time so we as teachers must also change the way that we teach. 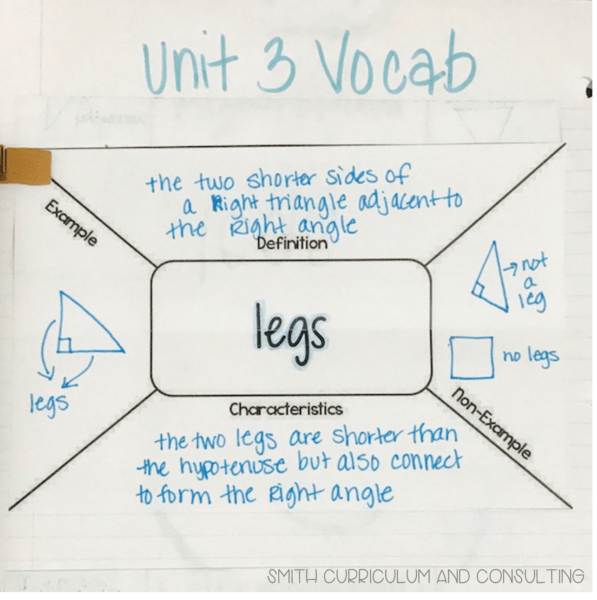 One of the ways that I have begun to teach differently than the way that I learned is how I use vocabulary in a content area. 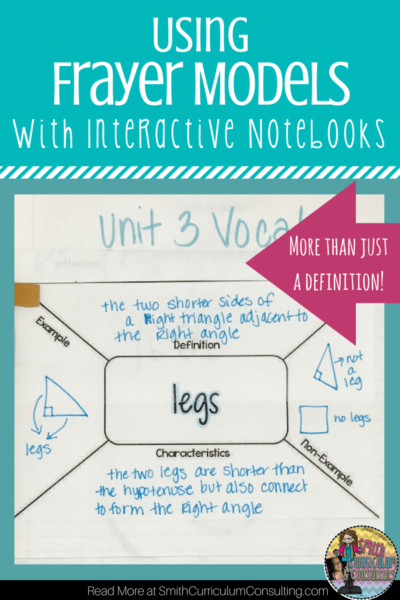 I learned about Frayer Models back in 2010 and started using them in my classroom to introduce and review vocabulary for math that was imperative for my students to understand. What is a Frayer Model? A frayer model was created by Dorothy Frayer and her fellow colleagues at the University of Wisconsin to help students develop a deeper understanding of new words. Frayer models consist of a definition, characteristics, examples and non-examples of a given word. What do Frayer Models LOOK like in action? As I was moving down to 7th Grade Math, I wanted to change things up a bit from the traditional frayer model but also keep it intact to what the entire method behind it’s existence was. I developed the diagonal frayer model that we used in our Interactive Notebooks and students really did enjoy. When it came to doing our vocabulary, I gave my students the definition to copy into their notebook. I wanted them to have a valid definition with all key components. This was part of their prep-work when they walked in which allowed me to go right into the introduction of the lesson as soon as I was done with attendance and such. Discussion would ensue about the vocabulary word and then we would talk about what the given vocabulary word looked like. So as I am displaying to my students a number line on the Smart Board, I would engage them to give me a number. We would plot said number and then refer back to our definition to then determine the absolute value. This allowed us to create examples at the same time as stressing the importance of what absolute value would LOOK like and then we made sure to notate characteristics. That would happen in all of about 5 minutes before then moving further into our lesson on how to use absolute value with positive and negative integers and then solving equations with absolute value. I’ve recently updated my Diagonal Frayer Model (with more simple fonts) for you to use in your classroom as well. This can be found individually in my Teachers Pay Teachers store or within the Interactive Notebook Starter’s Pack Bundle (also in my TpT store). They are in PDF format so that you can easily print them to be used in your class. I love this! Great examples of ways to get middle and high school students interested in vocabulary. Thanks for the great examples, videos, and Prezi. This was really helpful. I’ll be putting it to use this week. would you cut where the lines are before you put it in the ISN? or INB? or do you just leave it flat and glue it all like that? For the frayer models I cut around the outside of the rectangle, fold them in half and only glue on the back part that will be attached to the notebook. You have the front have then that you will write the word on once again. 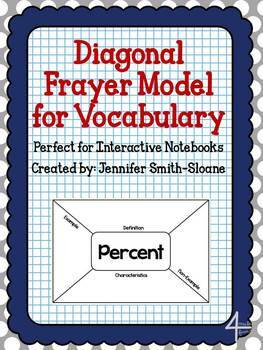 This allows you to fit more vocabulary words in your notebook. Love these and vocabulary squares.